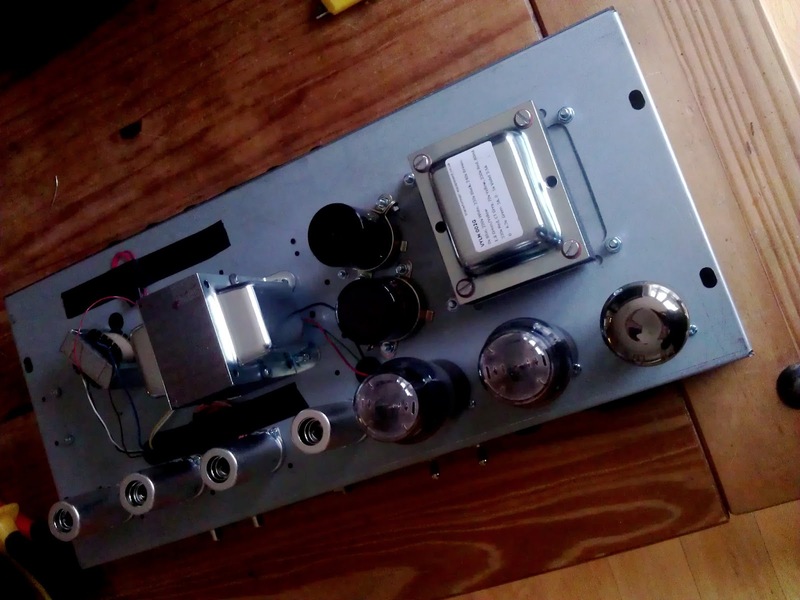 This page documents the building of reproduction of a 'Blackface Fender Princeton Reverb' based on a kit from Vyse Amps. The objective to build a high quality, custom amp that can be easily modified and maintained indefinitely. I had never actually made an eyelet board before, first step to drill holes and postion the eyelets to accomodate the components. The chassis came pre-drilled, although a few extra holes were needed for the cap cans and jacks on the rear panel. Barry at Vyse anps loaned me a Qmax punch - very helpful..
Then an hour or two of 'meccano' type assembly, and all the hardware now place to start the internal wiring. For the cabinet & speaker I have diverted from original Princeton spec. - I wanted a 12" speaker and bespoke look. For the speaker I elected for a Jensen P12R Alnico and for the covering an 'alligator skin' tolex with a wheat grill cloth. (not sure what the smudge is on the grill in the photo - its just a shadow). Vyse Amps did an awesome job of the tolex covering and supplied the cabinet and speaker fully assembled on request. Vyse supplied a matched pair of NOS GE 6V6G tubes on request. I completed the wiring and spent many hours fault finding and measuring AC and DC voltages. All tested ok, however at first full power up to test with a signal I got smoke from an over heating power supply resistor. > Part 5 - Fault Finding. I discussed the situation with Barry at Vyse Amps and he kindly agreed to take a look with me. After several tests it appears that one of the power valves was faulty - even though they tested positive on a valve tester at low voltage. Now the amp is stable at power on with all voltages present and correct. Plugging in a guitar gave a very low output signal, some scratchiness in the volume control, obviously something wrong with the wiring, joints or connectors in the pre-amp stages. Signal generator and oscilloscope next to test the signal at each pre-amp stage. Have you the schematics or layout, please?